No Interior Tours available on Wednesdays or Sundays. Members receive discount for groups of up to four; please inquire. Larger groups will be divided for staggered entry. Get an up-close look at the Eameses’ celebration of life, art, and work as captured by their perfect arrangements of objects collected through their lives, all still set carefully in place. Feel how the house satisfied the Eameses’ original design mandate: to “…aid as background for life in work”. 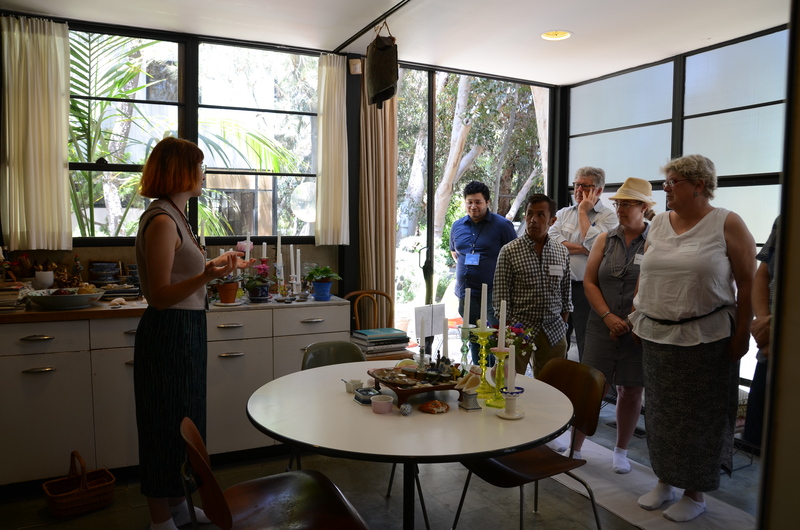 The private interior tour walks visitors through the ground level of the house as well as the studio. We allow four guests inside at a time; larger group interior visits may be arranged and are personalized to accommodate timing constraints. The guided tour is roughly 90 minutes long and packed with information on the history of the site, as well as on Charles and Ray. $275 ($225 members) for 1-2 adults. $450 ($400 members) for 3-4 adults. Reservations are required at least four business days in advance. Hours: Appointments are available at 10:30, 12:30 and 2:30. Tours are not offered on Wednesdays or Sundays. We recommend booking your appointment at least one week in advance in order to avoid disappointment. Booking a Tour: To check availability for an Interior Tour, please fill in the below form or call (310) 459-9663. We will contact you within two business days to schedule a date and time. To reserve your tour time, a deposit of $137.50 is required. Payment may be made via credit card by calling us at (310) 459-9663. The remaining balance is due at the time of the tour, and may be paid via cash or credit card. YOUR VISIT IS NOT CONFIRMED UNTIL YOUR DEPOSIT IS RECEIVED AT THE EAMES FOUNDATION. A 100% refund will be provided up to three full business days in advance of the tour (i.e., by midnight PST Wednesday for Monday); no refund or date exchanges will be provided thereafter.